Secret Window was the official first pick of our groups Halloween movie picks. See, no one wanted to take the blame for Dragonfly, not even Kevin Costner. My wife, Kendra, got to pick first and she chose a movie that she’s been telling me to watch for years. 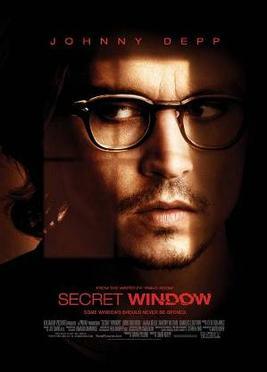 Secret Window, if you’re memory serves, was the film all your friends went out to see in March 2004 because they thought Johnny Depp was the best thing since Ashton Kutcher. Most of this was due to Pirates of the Caribbean: Curse of the Black Pearl being so freaking good. But Mr. Depp doesn’t play a pirate in Secret Window, he plays a writer! So all our little sisters and high school pals got tricked into watching a movie that was probably darker than they were expecting. The movie is about a writer (Depp) who’s being stalked by a man claiming that Depp stole his story. There’s a lot of ways to prove that not to be the case, the internet for one. But maybe the movie gets a pass because it was the early 2000s and not everything had been digitized yet? Depp then tries to solve the problem by going to the worst cop in the world, the laziest agent/bodyguard ever to protect, and having constant phone calls from his cheating ex-wife. Not a lot of it makes sense when held to a microscope. But maybe it doesn’t need to be over-analyzed because despite some obvious flaws, unlikable supporting characters and no real secret window, the film is surprisingly entertaining. Johnny Depp gives a surprisingly subdued performance (for the most part) and the movie has a few more laughs than I was expecting. There’s zero tension and it would be generous to even call it a slow-burn, but it’s not bad. Does it fit well in Halloween? Actually, it kind of does. It’s based off of a Stephen King story, so there’s that going for it in the eerie department. What really makes it is knowing the twist of the film because then you’re just watching a car accident in slow motion. Three and a half out of five star-shaped pumpkins! Posted on October 14, 2015, in halloween and tagged halloween, johnny depp, secret window, stephen king. Bookmark the permalink. Leave a comment.